Senior figures in local highways have urged the Government to produce new guidance for electric vehicle charging facilities but the Department for Transport (DfT) appears to be reluctant. The news comes as the highways sector is preparing for a major expansion in charging facilities, both on street and off, as the electric vehicle market continues to expand. The Government has announced that new diesel and petrol cars and vans will be banned in the UK from 2040 and chancellor Philip Hammond made electric vehicles a centrepiece of his autumn Budget last year. However the DfT appears unwilling to issue guidance to local authorities on how best to build and develop charging networks. It suggested to Transport Network that local authorities were best placed to determine what on-street charging solutions will work best for their areas and residents. However the recent conference of the Highway Authorities and Utilities Committee (HAUC(UK)) - which brings local highway authorities and the utilities sector together to advise government - one of its joint chairs responded to a question on the issue and suggested some guidance might be necessary. Jerry McConkey, CEO of JAG (UK), said: ' We tried to engage with the Government about getting some guidance out. Electric vehicles are coming – you can’t hide away from that. There’s a lot of companies out there who are trying to develop ways of delivering electrical charge points, particularly to terraced houses. I’ve been meeting with some of them already. 'The problem we’ve got is some of the ideas of these companies don’t currently comply with any kind of reinstatement specification. So we need to be open to new ideas and engage with them. I’ve already spoken to the chairs of working groups about these ideas, which are outside the box. 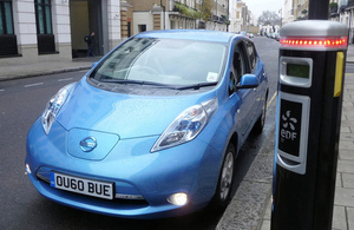 The Government has made a further £4.5m grant funding available to 2020 for the On-street Residential Chargepoint Scheme (ORCS) for local authorities to roll-out charging facilities on publically owned residential streets. The Energy Saving Trust, which administers the scheme on behalf of government, provides assistance to local authorities by sharing knowledge, expertise and directly supporting the development of more eletric vehicle infrastructure delivery plans and applications to the on-street scheme. In addition, the DfT highlighted that is £20m R&D of matched funding available to assist the development and trial of innovative and mass deployable public on-street charging solutions that can be installed across entire streets and communities. committing to electrify 25% of cars in central government department fleets by 2022 providing £100m to guarantee continuation of the Plug-In Car Grant to 2020 to help consumers with the cost of purchasing a new battery electric vehicle.